The Peanut Butter and Jelly Sandwitch is a classic of USA fare. Also, like many things USA, it is sloppy, short lived, over-sweet, and viewed by many as more than a little juvenile. Setting aside these problems, what can be done to improve it? As with all improvements, we must first fix our goals. I don’t mind the sweetness, or the associations with childhood, but I do resent how perishable and messy it is. Here’s a diagram of the main problems I’d like to fix. Planar layers result in leakage and jelly-bread saturation. The bread gets soggy and the jelly spills out! In short, the jelly saturates the bread in as little as an hour’s time, and also tends to leak out the sides. Of course, such a design is easy to fabricate, but that’s all that can really be said in favor of this approach. From these two simple observations, easily made by even the most casual observer, emerges naturally an improved peanut butter and jelly sandwich. 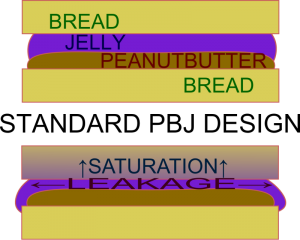 By sealing both pieces of bread with peanut butter, and creating a circumscribing gasket of the same, the jelly is both isolated from the bread and prevented from escaping the sandwich envelope. Of course, such speculations are all too easily made, from the armchair so to speak. What comes from actually putting them into action? Seal both sides with peanut butter and create a perimeter ridge to form the gasket. The first step is to seal the bread. I have found this is easiest when both “thin” and “thick” peanut butter are available (If you can keep only one kind on hand, the thick is preferable as it serves better during the gasket phase). Ensure that any holes in the bread are sealed with the thick peanut butter (a chunky “natural” style works best here) before using the thin peanut butter (the “smooth” kind, often mixed with oil and sugar, serves admirably for this purpose) to seal the inner surface of both sides of bread. If you prefer a larger dose of peanut butter, apply it now to one or both surfaces. Next use the thick peanut butter to form a ridge around the edge of the bread (see photo above). This step is tricky, and may require some practice. Placing the proto-gasket too close to the edge may result in leakage, while locating it too near the center will leave too little volume for the jelly. Luckily, peanut butter takes many months to “set”, and should remain workable for as long as you need. Once the peanut butter is in place, your choice of jelly can be added. Many other semi-fluid fillings work just as well including honey, jam, various syrups (chocolate, maple, or fruit), ice-cream, molasses, fruit smoothie, meringue, heavy whipping cream, or pudding… but jelly is the traditional compliment. Whatever you choose, be sure to not over-fill the sandwich. The level of the filling should be significantly below the proto-gasket ridge level, as the gasket will compress before it fully seals. 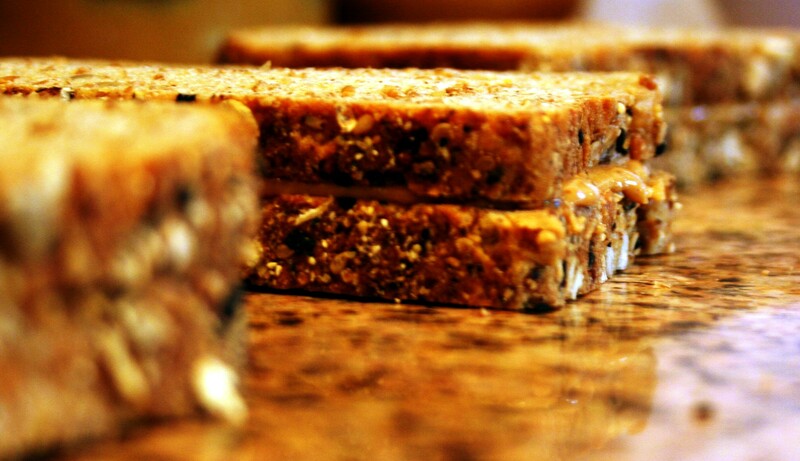 A properly sealed Peanut Butter and Jelly Sandwich will display only peanut butter around the perimeter. With the ingredients in their places, all that is needed is to seal the unit. At this point it is easy to become overly aggressive in pressing the bread together. Note that you have now formed a powerful hydraulic diaphragm pair. Any significant “squeezing” action in the center of the sandwich will cause inevitable filling excursions. This risk can be lessened by lightly pinching the edge to thin and deepen the peanut butter gasket, but can not be entirely eliminated. Handle the sandwich with care. Properly done, such a peanut butter and jelly sandwich will remain viable (without leaking or becoming soggy) for days if not weeks. If long storage periods are foreseen, store at reduced temperature to prevent ingredient spoilage. The hydraulic force amplification should also be kept in mind during storage and transport; individual rigid containers are recommended, as “squishing” tends to compromise filling containment. Further improvements are possible of course. One obvious step would be to replace the peanut butter gasket with a full bread perimeter (where the interior of the bread is cut out to accommodate the filling), which should improve the sandwich durability. Research is ongoing. Please share your results and further discoveries in this field in the comments below. I’m so glad this was helpful to you! I’m kind of on the fence about peanut embryos. They are much more bitter than the rest of the legume, and if given the option, I’d probably not eat them at all. On the other hand, they provide a contrast to the rest of the flesh, and I usually eat them first if I’m consuming peanuts individually. The embryo first, and then split the hemispheres and crush them both at once, one with each set of molars. I like peanut butter and jelly sandwiches. I prefer to just use a plate, and if the jelly spills, I just lick it off the plate. You can also lick the jelly off the sides if it starts leaking.